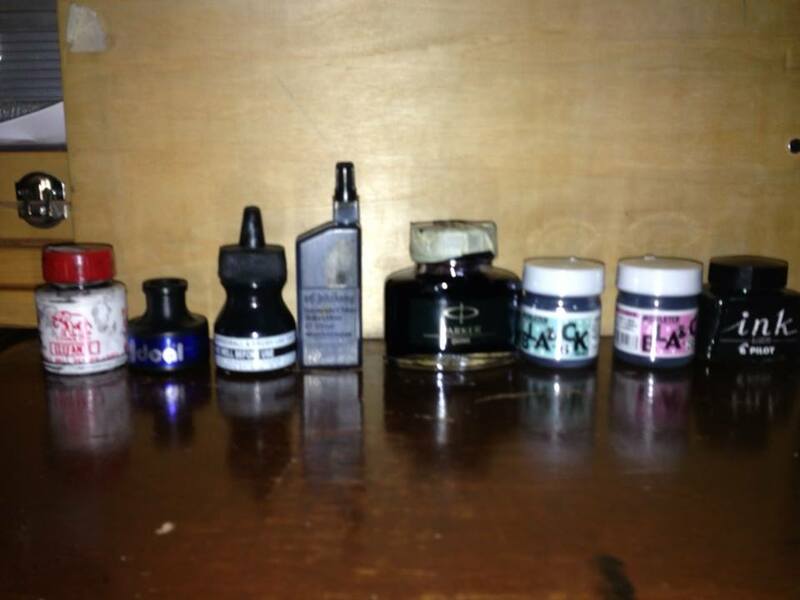 Here are some of the ink I have on hand at the moment. I know some of you may be familiar with some of them. pero this is ranked from cheapest to most expensive. Parker Quink – PHP229.00 huge bottle. opaque. drying time less than 15 seconds. good with copics. good with watercolor. ** FAVORITE!! **does not lift easily with heavy erasing. smooth application.A little goes a long way! One dip of the nib can go long My only quirk about this it its blue-black not black-black but its dark enough and thin enough for details. Deleter Black around PHP200.00 #3 drying time is 25 seconds. A little goes a long way! One dip of the brush can go long time. very opaque and matte. does not lift easily with erasing. Good with copics after drying. waterfast after truly dried. Deleter black #6 around PHP200.00 drying time is 25-30 seconds not bad. very fluid. very opaque and matte. nice for application. does not lift easily after erasing. waterfast and copic friendly after truly dry. Pilot ink – PHP 450.00LOVE this ink. fluid and slightly opaque. drying time is about 10 seconds. easily the clearest ink I use. need time to fully dry before being waterfast and copic friendly. Used by a lot of mangakas. Very nice also for washes. Bought most of this from National Book Store and Artmedia Trading. Also from Joli’s behind UST. I hope more stores will start carrying ink. I know Deovir has some nifty acrylic ink that I want to try. I will do a video of using them soon. Also babble while using them. I hope to do it as a part of the Pmangahub team blog launch >.> We do need a video editor so if you know someone who knows how to do it, let us know!! Is the Pilot Ink available in National Bookstore? If not, where can I get it? However Pilot brand ink do smudge and blot its not too recommended for finelining. if you like a nib ink that is cheaper, get redbarons india ink. Super cheap about PHP30.00 per bottle, try also getting fountain pens with refillable ink. Thanks for the heads up on the Pilot ink. And I’ll also try using the india ink. Hm, I liked all the posts about manga materials because you gave quick yet ample details on every item (please keep that up when discussing materials 😉 ). I’m not sure if this needs a full blog post, but I’d love suggestions on buying copics. What set you recommend, or would you suggest buying these markers individually? I’d love to know based on your personal experience with them. Sure I’ll work on it soon! Where can you get china ink?